Let's continue with No. 4, Hall of Fame first baseman, Lou Gehrig. Lou Gehrig was one of the greatest hitters and run producers in baseball history and cemented himself as a legendary first baseman during his 17-year career with the Yankees. Gehrig was a seven-time All-Star and six-time World Series champion before his career was tragically cut short by ALS (known by man as "Lou Gehrig's Disease") in 1939. He came into the league in 1923 and took over as the everyday first baseman for Wally Pipp in 1925. Gehrig was a vital part of the 1927 Yankees "Murderers' Row" team, batting .373/.474/.765 with 47 home runs and 173 RBI that season. Gehrig was one of the better run producers in the history of the sport, as he topped 100 RBI in 13 consecutive seasons and drove in more than 150 runs seven times. During that same 13-season period, Gehrig scored 100 runs each year and picked up at least 166 hits in all but one campaign. In 1931, he drove in 184 runs, which is the second-highest single-season total in the history of MLB. Gehrig finished his career with some astounding all-around numbers at the plate, hitting .340/.447/.632 with 493 home runs and 1,995 RBI. His slash line has the 13th-highest batting average, fourth-best on-base percentage and third-best slugging percentage in baseball history. He went on to win two MVP awards, a triple crown and a batting title in his career. Perhaps even more impressive, Gehrig was the starting first baseman for the American League in the first seven MLB All-Star games. Despite his dominant numbers, Gehrig might be a little underrated as he found himself in the shadow of Babe Ruth for much of his career. The duo spent 12 seasons together, amassing 4,484 hits, 826 doubles, 1,007 home runs and 3,428 RBI, all the while helping to make the Yankees baseball's preeminent franchise. 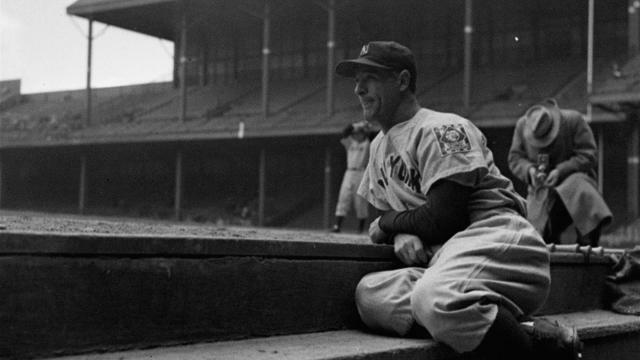 After he announced his retirement later in 1939, Gehrig received a memorable farewell by teammates, fans, friends and many among the sport and city at Yankee Stadium. The ceremony is one of the most notable non-game moments in MLB and Yankees history, with Gehrig's 'Luckiest man' speech considered baseball's Gettysburg Address and an iconic moment in franchise history. The Yankees retired Gehrig's No. 4 during that ceremony and enshrined him into Monument Park with a plaque and monument on July 6, 1941. He passed away on June 2, 1941 after succumbing to his illness.